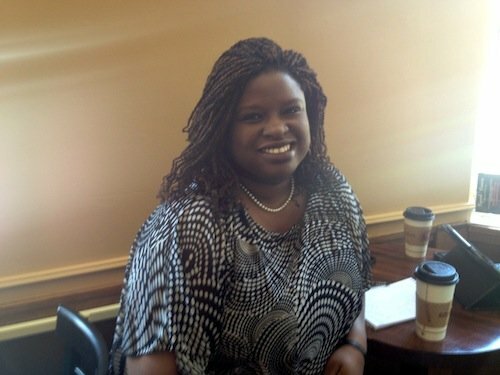 Lawyer, professor, scholar-activist, preacher, mom, volunteer and blogger, Nekima Levy-Pounds has a lot on her plate. The recent Star Tribune blogger (in addition to her writing for MinnPost and TC Daily Planet) is being thrown accolades left and right, but she takes it all in stride. Levy-Pounds considers herself a scholar-activist, which she’s been throughout her career, but it came into focus when she launched the Community Justice Project –—officially in 2007 though the work started in 2006. The program began as a partnership between the University of St. Thomas School of Law and the St. Paul branch of the NAACP. Levy-Pounds and a colleague named Artika Tyner, who had been one of Levy Pounds’ students, worked together to develop the program. As founder and Director of CJP, Levy-Pounds works with students who learn to use the law “as a tool to advance the cause of justice in our society,” Levy-Pounds said. The students engage in legal research and writing, advocacy, negotiations with government stakeholders, and hold town hall forums and produce reports, making them a partial think-tank. Recently, CJP has been doing a lot of work around the school to prison pipeline, “trying to raise awareness about some of the systemic patterns and practices of discrimination that are impacting kids of color and kids with disabilities,” Levy-Pounds said. Other issues CJP has been involved with include juvenile justice initiatives with Ramsey County and Hennepin County as well as economic justice work. Through CJP, Hampton has become involved with Brotherhood Inc., a nonprofit organization that CJP helped found and supports. Based in the Rondo neighborhood in St. Paul, the organization helps young African American men ages 16-24 who have been involved or are at risk of being involved in the criminal justice system or gangs. Hampton said he has worked with Brotherhood Inc. on legal issues, helping, for example, with a trademark issue for the coffee that the young men sell. Students of CJP do legal research and writing on behalf of the board and organization, draft business plans, and have redesigned the space and negotiate on behalf of the organization, Levy-Pounds said. Sidiq Abdullah, who is part of the Brotherhood Inc. program, joined as a favor for a friend, coming only once a week at first. Discovering that “they actually cared about us,” Abdullah found himself gaining a whole new mindset on life. “I have more hope and motivation to do better,” he said. Eventually, Levy-Pounds went to the University of Southern California, becoming the first in her family to earn a bachelor’s degree. Then she went to law school at University of Illinois. “I didn’t realize all the hurdles I would have to overcome, but this is definitely my destiny and my calling, and it’s a way for me to give back to the community,” she said. A mother of five children (two of whom are adopted), Levy-Pounds takes their education very seriously. Two of her daughters attend the same boarding school she attended, and her two sons attend Harvest Prep and Best Academy. Her eldest daughter just graduated from Park Center High School, and will attend North Hennepin Community College next year. Having five kids on top of all the community and professional work she does wouldn’t be possible, she said, without her husband, who’s an integral part of the work she does and raising the kids. As if all of the above weren’t enough, Levy-Pounds also serves as chair of the board for both Everybody In — whose goal is to help close the gaps in unemployment between Blacks and Whites and Native Americans and Whites in the region by 2020, — and the African American Museum and Cultural Center. “It’s a lot to handle,” she said, but she never feels like it’s too much. “I draw strength and inspiration from my ancestors and freedom fighters from the past who had to work under even more challenging circumstances,” she said. Levy-Pounds wants see people thrive. “I’m constantly rooting for the underdog,” she said. She also loves to laugh. “I have an interesting sense of humor and I find humor in the strangest things,” she said. “So my students will find me laughing until I cry.” She loves poetry and spoken word, and through CJP engages young people through poetry and spoken word, starting a forum called Uncaged Voices, which is a poetry slam on youth justice. They’ve held two events so far at Intermedia Arts. Read articles by Nekima Levy-Pounds in the Daily Planet.